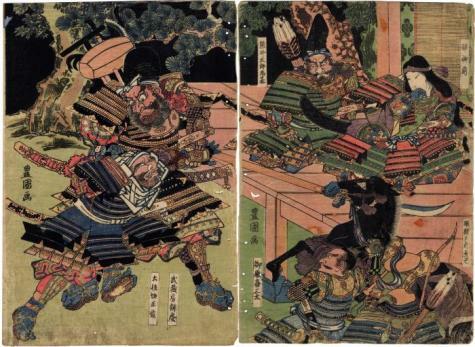 The description of the whole triptych reads: "The scene pictured here occurred at a time when Minamoto no Yoshitsune and his half-brother, Yoritomo, had become sworn enemies. Tosabō Shōshun, a vassal of Yoritomo, had gone to Horikawa to spy on and possibly attack Yoshitsune and his encampment. With the exception of Yoshitsune and Gozen, Toyokuni uses cariacature in his delineation of all the figures, especially Benkei and Tosabō. In striking contrast, the features of Yoshitsune and his mistress are refined and rendered without colour. However, the strength of this work resides in the grappling on the left sheet between Benkei and Tosabō. The names listed on the print include (right sheet): Suruga no Jirō Kiyoshige, Genkurō Yoshitsune, Ise no Saburō Yoshimori (upper part), Kamei Rokurō Shigekiyo, Kataoka Hachirō Hirotsune (lower part); (centre sheet): Shizuka Gozen, Kumai Tarō Tadamoto (upper part), Hori Yatarō Kagemitsu, Oumaya Kisanta (lower part); (left sheet): Musashibō Benkei and Tosabō Shōshun." Quoted from: Japanese Warrior Prints 1646-1905 by James King and Yuriko Iwakiri, pp. 174-75. Illustrated in color at the bottom of both pages. The full triptych owned by the Lyon Collection shows the Tsurya Kiemon publisher's seal on the right-hand panel. Since these two prints are missing that panel we can only assume that these were also published by that house.